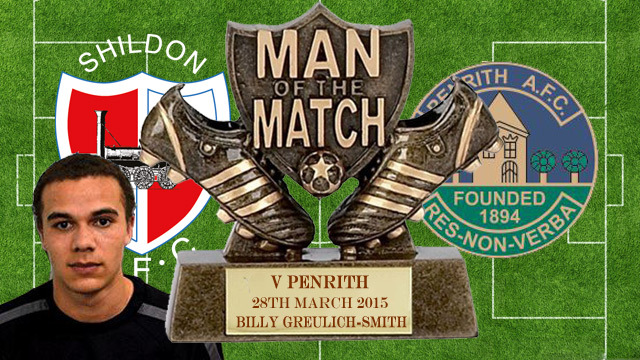 In blustery conditions Shildon ground out a 2 – 1 home win against Penrith on Saturday 28th March 2015. Kicking with the wind behind them a John Brackstone free kick was punched away in the 1st minute. Shildon could have been three goals down within the first 9 minutes. On the 4th minute Penrith’s Martyn Coleman was pulled back inside the area by Darren Craddock for a clear penalty, but the referee said play on. Minutes later Sam Bells great left foot shot was punched over by Shildon’s keeper Kyle Hayes. On 9 minutes a Sam Bell header was goal bound but it hit a Penrith player near the goal line and bounced out. Against the run of play Shildon took the lead on 14 minutes when Mark Doninger was fouled and Lee Scroggins scored from the free kick. It was 2 – 0 shortly after when Billy Greulich-Smith fired a right foot shot into the bottom corner. On 34 minutes Shildon should have also been awarded a penalty when Billy Greulich-Smith was pushed over in the box, but once again the ref. said play on. Before the hour a Billy Greulich-Smith header was dropped by keeper Richardson, but the ball was scrambled away. Taking advantage of the wind behind them, Penrith looked a far better team and on 66 minutes a great right wing corner was headed home by Will Paul for 2 – 1. Thereafter Penrith took control of the game with Shildon defending corner after corner. In time added on a long free kick from Sam Bell assisted by the wind was goal bound but once again Shildon’s class keeper Kyle Hayes punched the ball over the bar. The Railwaymen were relieved to hear the final whistle. Goalscorers: Scroggins 14, Greulich-Smith 19. Subs: Jones for Doninger 83.